I just read Car & Driver’s review of the new Mercedes C450 AMG. They like the car and generally feel it’s a fine competitor for the BMW 335i xDrive and Audi S4. But apparently, there are certain owners of AMG products who are none too pleased at the existence of a more-affordable car with AMG badges. Three-quarters of a C63 AMG. And that&apos;s pretty damn good. The C450 AMG is the first of Mercedes’ new AMG Sport lineup: performance-y versions of the regular cars, but without the fancy hand-built motors of full-on AMG cars. So basically the exact same thing the as the BMW M235i being not a full-on M car. AMG Sport models still have a zero in the name of the car (i.e. C450 AMG rather than C45 AMG) and get AMG badges on the fenders but not the trunklid. To Steve Siler of Car & Driver I am a AMG owner and I would like to encourage you to investigate what the current AMG owners say about this new “AMG Sport” model. Their has been such a blowback to AMG management. The owners on the AMG blog are furious at these new models . AMG is suppose to be One man One engine but this new V6 is a reg production engine. The C450 is simply a C63, in and out, with a reg V6. AMG Owners are furious to the point a recent thread “C450 AMG BEING SLAMED ON SOCIAL MEDIAS” on AMG Private Lounge was shut down and locked because the response from management was condescending to AMG bloggers. It got real ugly I assure you. Seems AMG will have a Sport version in every Class. You think current owners of real AMG’s are pleased? Numerous owners are demanding a reply from Tobias Mores but no response has come of yet. Many have assured they are cancelling their orders for a new car. many are saying goodby and selling their AMG’s Please investigate from an owners point of view how they see this new Sport model. How would you feel if you owned a C63 and an identical pulls up next to you with factory AMG badges and looks identical for $15,000 less? AND, this AMG Sport version is coming to all classes. Will they have an AMG-GT Sport? How will E, CLS, S class 63 owners feel about this Sport version. We feel betrayed to say the least. They have blurred the line between a MB and the AMG. Its not that AMG owners don’t want to grow the family, we simply believe the exterior style should remain exclusive to a real AMG, just like a Black series does. 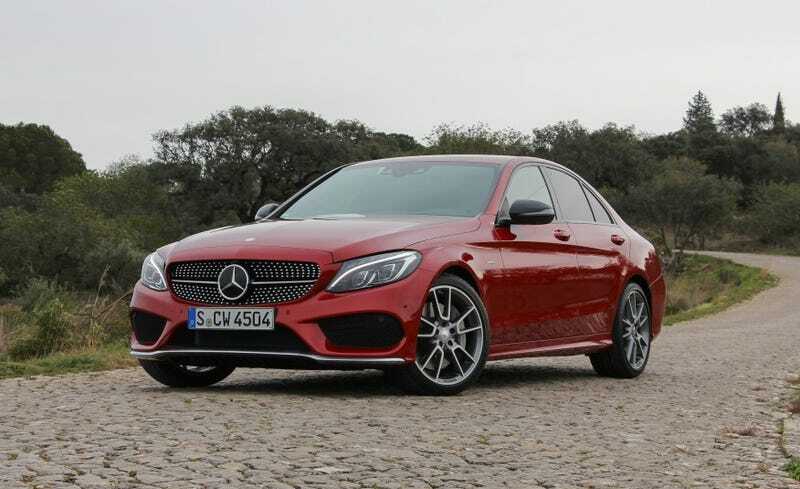 These new Sport models should of been called “ Tuned By AMG” this would of stated clearly that your C450, with non AMG styling cues, is a supped up C400 and was by tuned by AMG. Its not an AMG but real close because a Mercedes tuned by AMG is NOT an AMG vehicle. Will we soon have a Black series Sport version?? Its a total disaster ! Paul T. is mad! So mad that he has totally forgotten how to properly use punctuation and grammar! HOW WOULD YOU FEEL IF YOU OWNED A C63 AND AN IDENTICAL PULLS UP NEXT TO YOU WITH FACTORY AMG BADGES AND LOOKS IDENTICAL FOR $15,000 LESS? I tried finding more information about the qualms of the very upset AMG owners, but I don’t have access to the Mercedes-AMG Private Lounge, because I don’t have an AMG Mercedes. I was however able to find this thread on MBWorld talking about the blowback from the “C450 being slammed on social media” thread. It would seem that someone from Mercedes had to step in and pull the reigns on all of the “real” AMG owners’ jimmies being rustled. I also found another thread where MBWorld introduces their review of the C450 AMG with the headline, Mercedes-Benz C450 AMG Sport Is One Fast Poser. Many more jimmies are rustled therein. 11 pages and counting worth of jimmies rustling. This all seems like a whole lot of getting butthurt over nothing. If you have a C63, you still have like 100 hp more than the C450. Does the C450 existing somehow threaten your sense of self worth as an AMG owner? I know people buy fancy cars with fancy badges for status symbols and not just because they like cars, but this is all a bunch of crying over spilt milk. WAAAAAHHHH MY AMG ISN’T AS SPECIAL ANYMORE BECAUSE MERCEDES MADE A CHEAPER NOT-QUITE-AMG THAT STILL SAYS AMG AND LOOKS LIKE AN AMG! Driver of a non-M BMW that nonetheless came factory equipped with a total of seven M badges.